You can imagine my excitement with Honest Cooking asked me to create a recipe with cheese! Yes, of course I will be home to receive your package of multiple blocks of tangy Havarti cheese! And you want me to cook with it? Test it, eat it? Enjoy it and share my thoughts? Oh no, you shouldn’t have! No, I love YOU more! It was all about the creativity for this recipe and you know I had to go all cultural on ya! A few years ago when Joe and I drove to Vegas for a mini getaway, we were stranded outside our hotel because it was too early to check in. 4 hours of driving and stomachs growling, we found this little yellow hut off the strip and really in the middle oh nowhere but an empty parking lot. 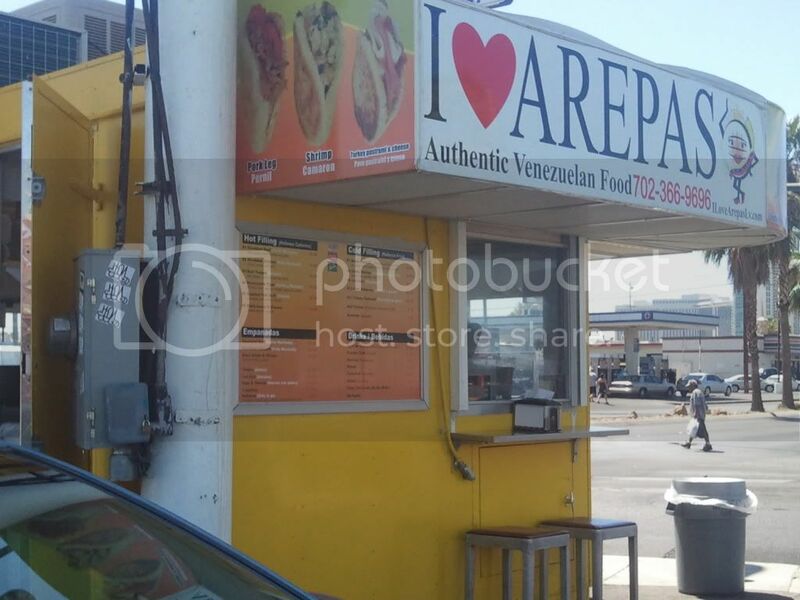 We both had no idea what arepas were but so glad we found out. It only took 4 years to recreate a homemade arepa at home and attempt to re-live that initial moment. Of course nothing is going to change the way we felt that morning, driving to Vegas, excitement and hunger all at once. Bit it was fun to try. 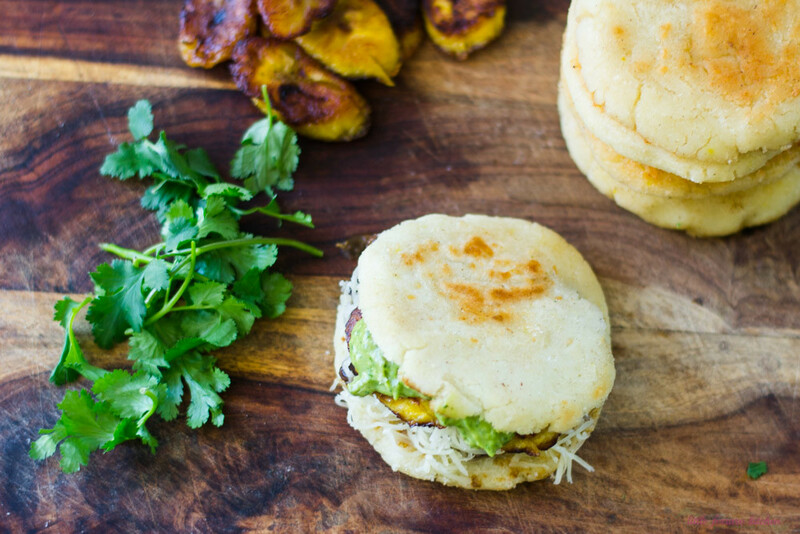 So what are arepas exactly? Well I’ve read that they can either be from Colombian and Venezuelan backgrounds, but basically it is a corn cake that is cut in half and filled with whatever you like! There are cheese arepas, meat arepas, bean arepas or you can just cook the corn cake and enjoy them with a bit of salt and butter. For this creativity challenge, I wanted to include as many South American flavors as I could, but still keep it classy, after all. I have been quite addicted to plantains and black beans recently and couldn’t wait to stuff those into my arepa. 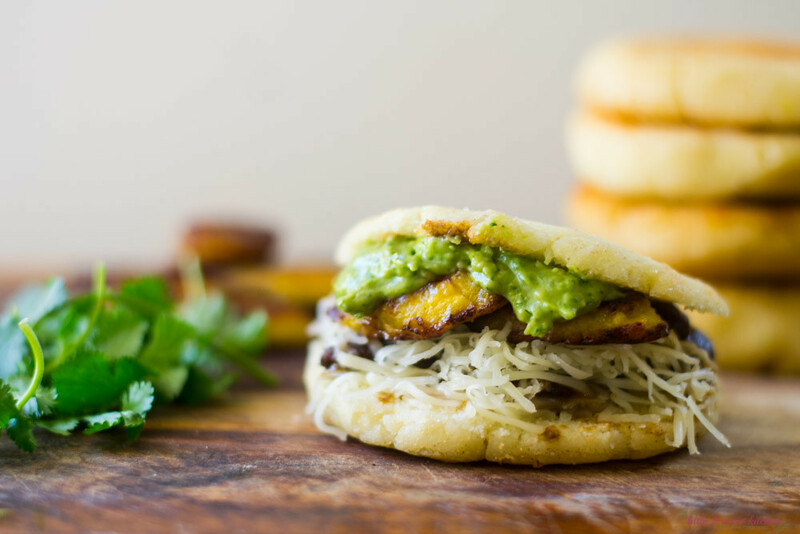 Tangy havarti cheese was mixed in to both the arepa batter and as a topping, because anything with more cheese is always better! And to cool down the spicy black beans, I made a quick creamy avocado sauce that is perfect to slather all over the fillings. Also, a few things to consider. 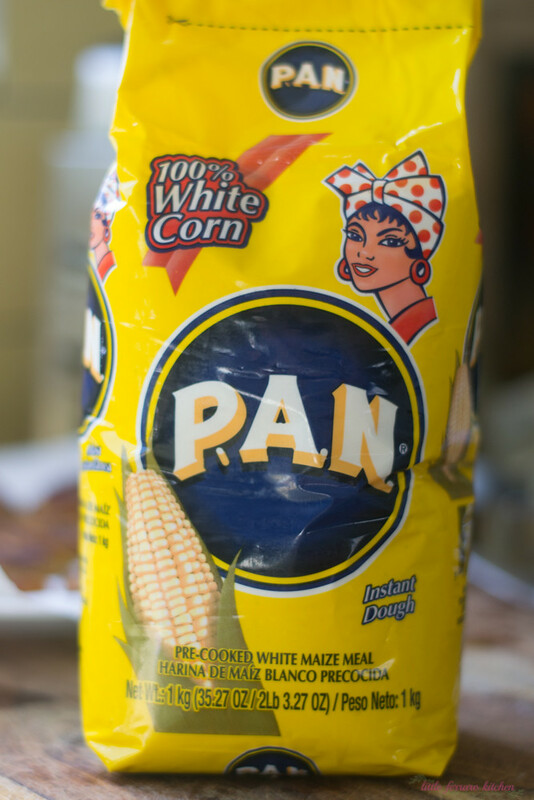 The beautiful thing about arepa is from the corn flour, which you can find easily at Hispanic markets, called “PAN”. Its a very fine corn flour, much finer than polenta or anything like that and pan-fries beautifully, keeping the outside golden brown and crunchy and the inside soft. Here is what the package looks like. 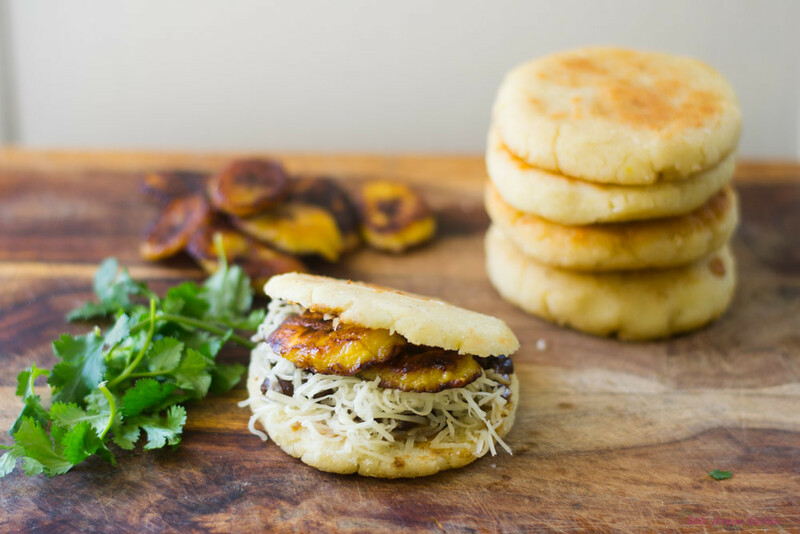 Have you ever had arepas? What would you stuff yours with? First make the arepa. In a bowl add together the flour, cheese, oil, salt and slowly mix in the water. Use clean hands to mix everything together until a firm dough forms. If it is too dry, add a bit more water. When done, cut into 4 equal pieces and use your hands to form 1 of the pieces into a disc, about 2-3 inches in diameter. Set aside. Heat a large non-stick skillet with a bit of oil to coat the bottom of the pan and add the arepas. Cook on medium heat until the first side is a nice golden brown and then flip over and continue to cook the other side, about 4-5 minutes per side. When done, set aside. In a small pot, add olive oil and garlic and saute on medium heat for about 2 minutes until the garlic begins to turn golden brown. Add in sazon (or paprika) and stir spices into oil. Then add black beans, liquid included and salt and pepper and cook on medium heat until it comes to a gentle bowl. Use the back of a spatula to gently press down on some of the beans to make for a thicker consistency. Cook for about 15 minutes until tender. Taste for seasoning. Add ripe plantains to a lightly oiled skillet and fry on the first side until golden brown, for about 3-4 minutes. Then flip over and cook on second side until golden brown. The plantain should soften and get sweeter as the sugars are cooked out. When done, set aside on a paper towel lined plate. Add all ingredients to a food processor and blend together. Add a bit of water, to thin out consistency if desired.Taste for seasoning. Cut one of the arepas in half, opening up like a sandwich, but don't cut all the way through. It should be like a pocket. Then spoon in 1-2 Tb of black beans, more shredded Havarti cheese, plantains and avocado sauce. Corn cakes (arepas) can be kept in a ziploc bag and re-heated in the oven. The avocado sauce makes a great dip for vegetables and tacos! Learn how to fry plantains with my easy recipe for simple fried plantains. 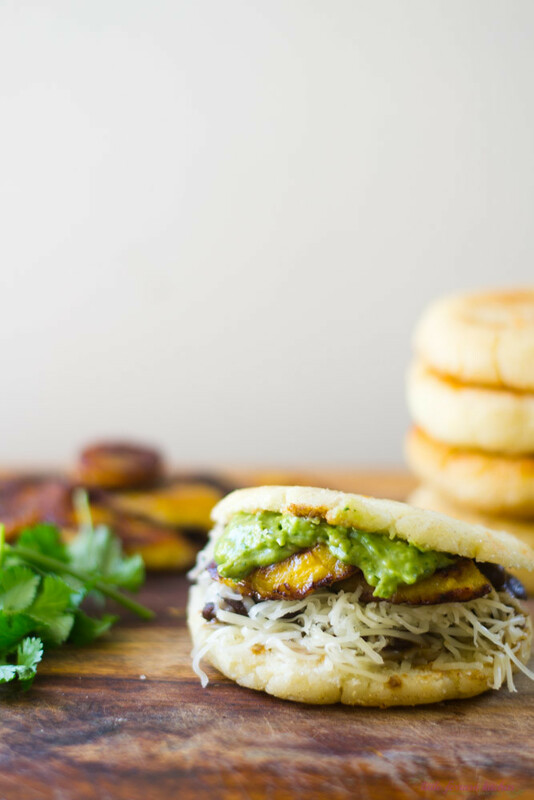 I’ve never heard of arepas.. so I can’t imagine what they taste like but they sure do look delicious. I’m glad that you developed the recipe to perfection so you could share it! I have had Arepas off the street in Venezuela and while I am not a professional Arepa maker, these were very good! Loved the combination of flavors. Making them again this week. Thanks for sharing Jennifer!! I need to make more arepas..they are so good!